Do you like to surprise and delight your friends and family? Of course, we all do! Join me and learn four unique pop-up techniques that you can use on projects of all kinds. 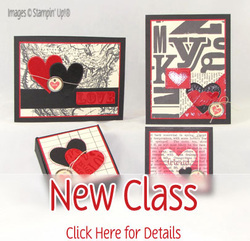 Make cards for Valentine’s Day or simply to say you care anytime of the year. The cards and pop-up techniques range from simple to sublime - giving you choices of the perfect pop-up for everyone on your list. Cards are designed with kids, guys, and friends in mind. Create these special cards and pop-up treat box for a school class, co-workers, family, friends, and your sweetheart - let your love burst out joyfully! Contact me today to join the fun! This includes all the supplies and materials prepared for you to make 3 cards and a box. You'll make a basic pop-up note, accordion pop-up card, a slider pop-up card and spiral pop-up box. Come join in the fun! Yes No, I'll do that now.